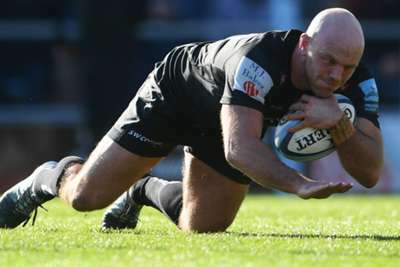 Exeter Chiefs became the first team to seal a Premiership play-off spot and stretched their lead at the top of the table to nine points with a 29-10 bonus-point defeat of Bath at Sandy Park. Rob Baxter's side stretched their winning streak to four matches on Sunday to secure a top-four finish with five matches of the regular season remaining. Bath led 10-3 after Nathan Catt ploughed his way over from close range, but that was as good as it got for Todd Blackadder's men. Centre Ollie Devoto took a pass from Joe Simmonds to cross against his former club and Jack Yeandle burst through to scoot under the posts, giving Exeter a 17-10 lead at the break. Ruthless Exeter – with England duo Henry Slade and Jack Nowell back in the side – were given breathing space when a penalty try was awarded for an incident which resulted in Beno Obano being sent to the sin bin. Olly Woodburn rounded off a sweeping move that started on the halfway line by grabbing the bonus-point try in what was ultimately a comfortable victory for last year's runners-up.